Colorado Gov. Jared Polis declined to rule out legal action against the Trump administration to halt the president’s declaration of an emergency to fund a wall on the southern border of the U.S.
“I believe that the president’s actions are illegal, and we’ll certainly explore any way that we can play in preventing this divisive and wasteful and false emergency,” he said. 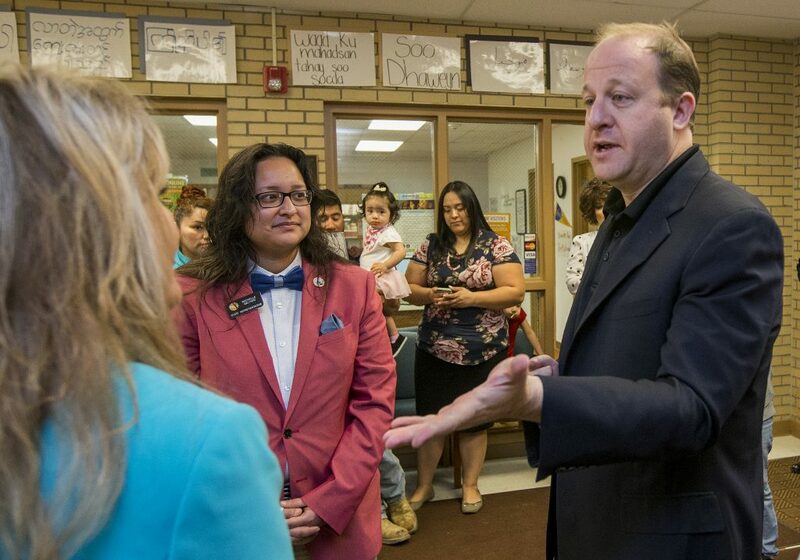 Polis, a first term Democrat, was in Greeley on Friday morning at Jackson Elementary School, 2002 25th St., to tout his administration’s plans for all day kindergarten in Colorado. Polis answered a Tribune reporter’s question about the emergency declaration after taking a tour of the school. California Gov. Gavin Newsom said Friday that his state would sue the Trump administration over its declaration of a national emergency. Colorado Attorney General Phil Weiser said he hasn’t yet decided whether to follow California’s lead. In his comments to The Tribune, Polis did not commit Colorado to any action, but he did not rule out a lawsuit either. “Emergencies should be reserved for actual emergencies and they shouldn’t be reserved for just because you loose a legislative battle, and the president is welcome to advocate for his wall and he obviously is a supporter of that, but when he doesn’t win you can’t just pick up your toys and declare an emergency,” he said. Congress has given Trump about $1.4 billion for border barriers, well below the $5.7 billion Trump has insisted he needed to build the more than 200 miles of border wall he wants this year. Trump’s move has been condemned by Democrats and elicited threats of lawsuits from states and others who might lose federal money or say Trump is abusing his authority. The ACLU also has said it will pursue legal action against Trump. For his part, Rep. Ken Buck, a Windsor Republican, largely backed Trump’s move. Sen. Michael Bennet, conversely, supports the deal but not the president’s decision to declare a state of emergency. Trump’s declaration of an emergency came after lawmakers voted Thursday to fund large swaths of the government and avoid a repeat of this winter’s debilitating five-week government shutdown. Buck joined 108 other House Republicans in voting against the bill. Sen. Cory Gardner, R-Colo., said in an emailed statement he has long supported bipartisan border security and Congress is the proper forum to address such issues. Democratic Congressional leaders vowed to block the emergency declaration. “The Congress will defend our constitutional authorities in the Congress, in the Courts, and in the public, using every remedy available,” House Speaker Nancy Pelosi, D-Calif., and Senate Minority Leader Chuck Schumer, D-N.Y., said in a joint statement. In Congress, Democratic leaders could introduce a joint resolution of termination in a bid to end the emergency status. Neither Buck, Gardner nor Bennet said immediately how they would vote on such a measure. “I’m currently reviewing the authorities the administration is using to declare a national emergency,” Gardner said in the statement. — Tribune reporter Emily Wenger contributed to this report, as did the Associated Press.